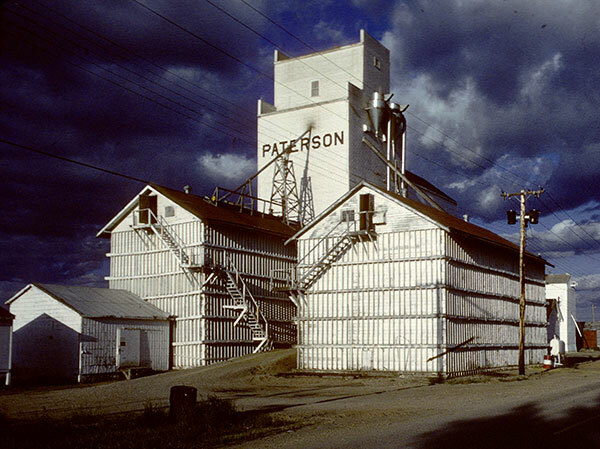 A wooden grain elevator in Killarney, on the CPR Napinka Subdivision in the Rural Municipality of Killarney-Turtle Mountain, was built by Paterson Grain in 1927, using materials salvaged from two previous elevators. It was replaced by a larger elevator east of Killarney opened in 1980. Source: Historic Resources Branch, Grain Elevator Inventory, slide 2131.